One of the nicest aspects of the Bespoke Tailors Benevolent Association dinner every year is the evening wear. Although most cutters and tailors aren’t actually into clothes and style, they are all wearing something bespoke – so the fit is good – and there are enough with style to make for good people watching. Here are five that we particularly liked this year. There was a lot of velvet – on everyone, not just these guys – and others that were interesting were often so because of their cloth, as with Francis and Michael. 1. (above): Matthew Crocker, the military manager at Gieves & Hawkes. 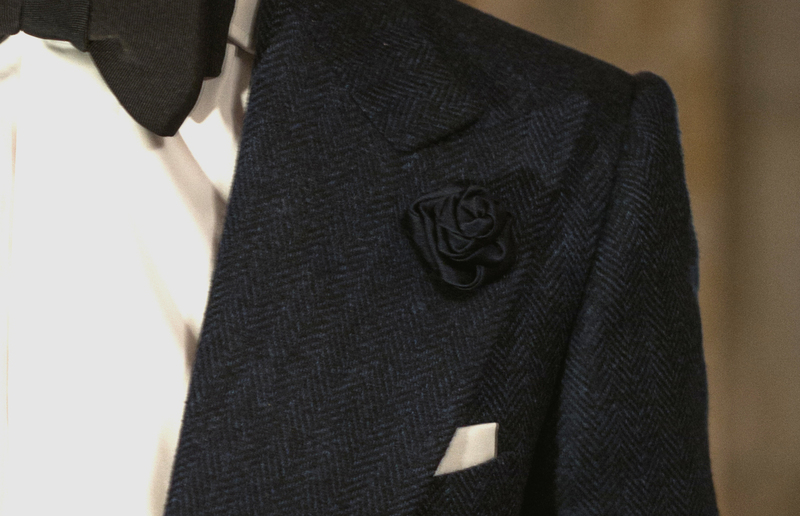 Navy velvet with a lovely line to the lapel. 2. (below): William Skinner, of Dege & Skinner. Black velvet with green silk waistcoat. Note the BTBA medal (on the left, as with all non-military medals). 3. Francis Paley of Chittleborough & Morgan (below). 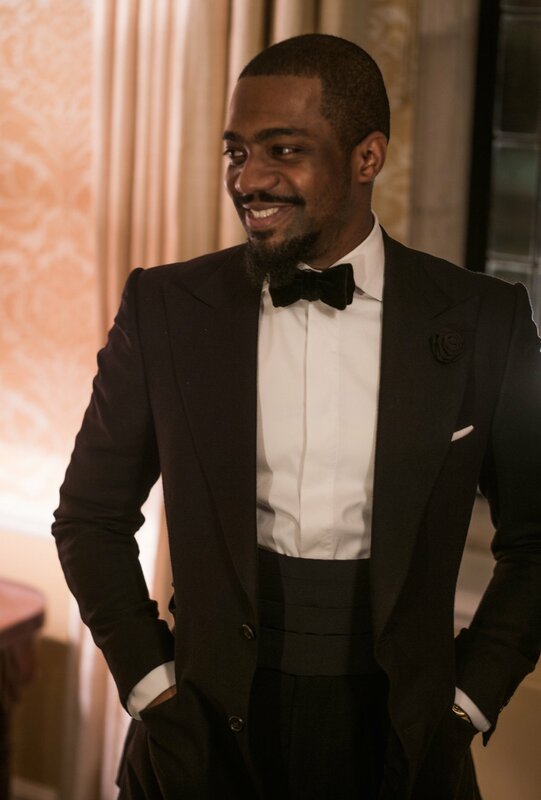 The big shoulders and lapels of a Chittleborough & Morgan suit always look very striking on Francis, given his tiny waist. The cloth is a blue-and-black herringbone from Loro Piana, the silk boutonniere something C&M regularly makes to match its ties or facings. The double button is something Francis made when the jacket got a little snug (I don’t think he’ll mind me saying that…), and he now likes as a look. Feels a touch dressier as well. 4. 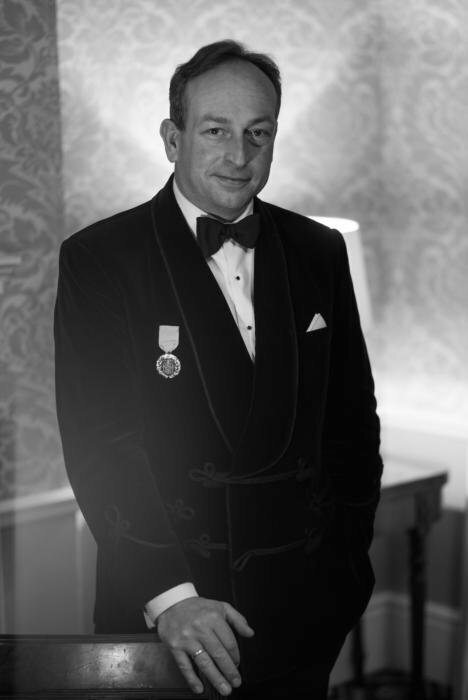 Simon Cundey of Henry Poole. Double-breasted black velvet with some nice frogging going on. 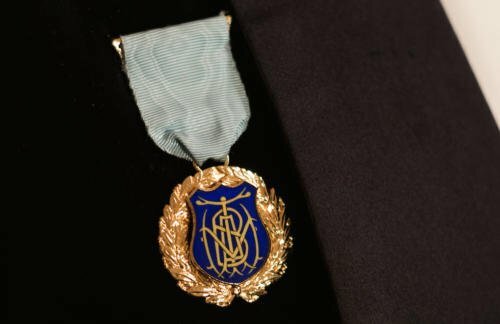 Has also earned his MTBA medal (the old version of the BTBA – it was merged recently). 5. And last but by no means least, big bad Michael Browne of Chittleborough & Morgan. It’s a suit in a black wool/cashmere flannel from Yorkshire Textiles. And what was I wearing, I hear you ask? My Timothy Everest brown-velvet jacket (we all got the memo). Ageing pretty nicely, particularly with Claire of Hawthorne & Heaney’s beautiful embroidery on the lapel (gold oak leaves). And a vintage embroidered/lace handkerchief. By this point in the evening the shoot had got a little silly…. You can follow the discussion on BTBA dinner: The best-dressed men in black tie by entering your email address in the box below. You will then receive an email every time a new comment is added. These will also contain a link to a page where you can stop the alerts, and remove all of your related data from the site. Yes. And and a particularly formal black tie event, yes. How formal it is will be something you have to judge of course. It helps if you’ve been before! Disappointing that there’s no conventional Dinner Jackets there. I’m a big fan of smoking jackets, but when half the men are wearing them, surely it’s time to go back to a classic three piece? Simon, have you notice differences in the reasons for choosing a career as a cutter, jacket maker between the old guard and the younger generation? I’m thinking of your comment about many there not being interested in clothes and style, is this changing? Is the current menswear scene attracted a more style contentious generation into the profession? Yes, absolutely. Certainly on the Row, and in other countries too. Great examples all around, although Paley’s is a little extreme for my taste. I’m surprised that everyone didn’t button his jacket when standing up (of course, you did it Simon). No matter the cut or style, in my mind, it looks better that way. But wearing a cummerbund or waistcoat you need not button your jacket, need you? Those without vest/cummerbund seem to have buttoned their jackets. Im not sure if I like this… Is it your taste that leaves out traditional attire, or the lack of people wearing it well? I know you say these are more interesting but all your clothes are pretty traditional, is that to say not interesting? It’s an interesting question. If you want to pick out well-dressed men at a black tie event, where everyone is wearing bespoke so everything fits perfectly, you inevitably look for unusual things – materials, accessories, details. Otherwise how do you select 5 people out of 300? 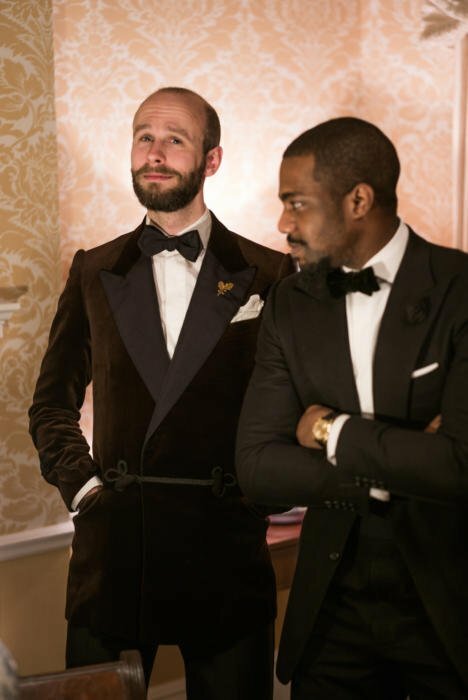 Perhaps half of those you can discount because they don’t have some elements of black tie you think should be worn – eg a shirt with a covered placket or studs, not just plain buttons; or either a waistcoat, cummerbund or DB to cover the waist. But that still leaves 150 or so. Perhaps ‘best dressed’ is not the best phrase in that case. It’s certainly the more interesting men, however, given the context. I think most readers know the basic rules of black tie and how to wear it well. But fewer would think a black flannel could work as well as it does on Mike, for example. A fair point, well spoken. What would be interesting to take away is how mere laymen can make black tie interesting without going so Ar as any of these, whilst being fairly formal and traditional? Simon, as the BTBA can be considered as a Club , wearing smoking jackets at the annual dinner of this Association seems to me very appropriate . According to the ” classical dress code” the wearing of a smoking Jacket at own Club is one of the few , if not the only , correct use of this garnment in a “public context”. All the pictured smoking jackets, including Yours, are splendid and superbly worn. Nice variety of styles and cloths, and thankfully everybody wearing the correct collar on their shirts. I think this is one area in which you are wrong, for two reasons. Firstly the wing collar creates an unnecessary break in colour, going collar, bowtie, collar, jacket there is just too much going on! Secondly wing collars need to be starched to not look floppy and scrappy, and when a starched (and therefore inevitably high) wing collar is worn the height is not offset by the length of a jacket (as it is with morning dress or tails). So not only is it against the rules, but breaking said rule (which I am not against at all, brown in town etc is fine by me!) only serves to look worse. It looks confused about formality and unsure of itself. Thanks. I like your examples but I don’t think they necessarily apply. The breaking up of the collar into bands is a purely subjective area as to whether it looks good or not. It is not necessarily out of keeping with anything else in the outfit. Equally, I can see the logic of having a high collar matched to longer proportions elsewhere, but on a tall man such as myself the jacket itself is pretty long. Whereas on a short man (maybe with a long neck!) the proportions would be entirely different. The only consistent guide in this area is formality. What looks smarter. And a stiff wing collar is uncontroversially smarter than softer turn-down one. Everything else must be just as formal to work with it. Ahh, we’ll agree to disagree! On another, unrelated note, how many pairs of spectacles are too many? I wear glasses daily and have one pair. Is it better to have a staple ‘look’ as it were, or to have two or three pairs and vary them? Well I suppose that rules are there so that they can be broken. Who would wear a turn down collar with white tie? Thanks for posting this report! Unfortunately short, but very insteresting!The pic where you stand beside Graham Browne could easily be used as an ad! Before reading it, I instantly loved Francis Paley’s jacket with its two buttons! Only taylors with a genuine sense of style and creativity could improvise such a trick that can stand for a defining feature of a special jacket! I think you mean Michael Browne! Not necessarily. In bigger houses, the front of house (the salesman) is often far more of a dandy and into style. They are the ones who help you pick cloth and style. And among the smaller ones, some definitely do have style – but they’re not the kind of people that necessarily have tables at events like these. Off-topic post. Dear Simon, what’s your opinion on lined linen and cotton jackets? I wonder whether the advantages of linen and cotton would be lost once temperatures reached the mid-twenties. It means that in the future readers are more likely to find similar subjects together. Most of the traffic on this site is people reading the 1500+ posts in the archive, rather than the latest one. I don’t suppose you know the name of the bunch used in Francis’ suit? One of the reasons I so enjoy this site is the occasional “whilst.” It’s up there with “quite” as a single-word response. Any interesting footwear, Simon? Opera pumps? Anyone pair embroidered slippers with a smoking jacket? great post (again)! One question regarding Michael Browne’s cuffs: it seems they are a kind of double cuff but without cufflinks? Can you comment on these, please? Looks like a cocktail cuff. A quick question on black tie etiquette and style if I may. I have been invited to my first (proper) black tie event (It’s a legal event and I am the plus 1). I would like to buy rather than rent the necessary attire but do not have a huge balance for this unexpected but pleasant occasion. I was think of the Anthony Sinclair midnight blue shawl collar dinner suit with a slim fit dress shirt by T&A. 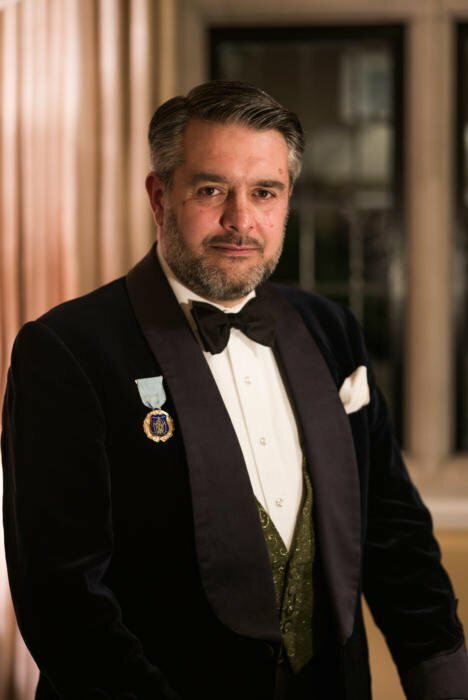 Other than any general comments or suggestions on alternative sources of a dinner suit for a similar budget (£700-8£00) my question is this; should the bow tie also be a matching midnight blue (also from AS), or black? The bow tie should really match the facings (the lapel) which will normally be satin or grosgrain. An ecru dinner jacket is really for sunnier countries, but you could get away with it at most black tie events. Given how few you seem to go to, though, I wouldn’t risk it. And one money-saving tip: try to get a normal white shirt, but with a covered placket so you can’t see the buttons. This will look smart enough for black tie, but also be fine to use normally. Think I’ll go buy a smoking jacket now! Simon, first of all thanks for those precious advices. 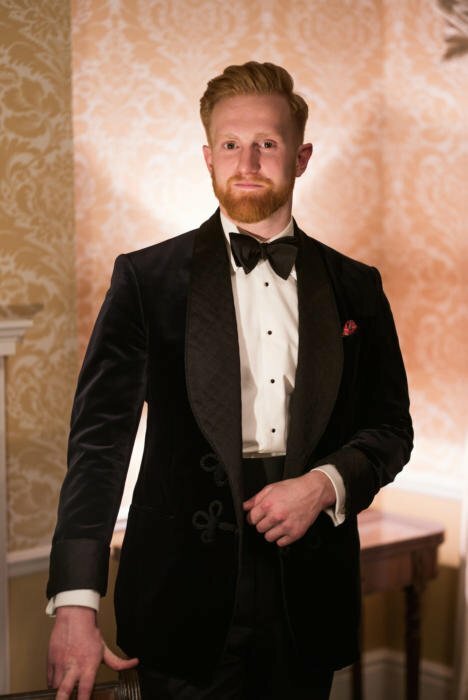 I am at the moment preparing my wedding which should take place in the second half of next year, and I was considering getting either a bespoke tuxedo or morning suit, as the time of the wedding hasn’t been set yet (or MTM if the budget doesn’t allow it, but I’d really prefer to go for bespoke). And as bespoke takes time, I think it’s never too early to gather information. Now here’s a few issues I have: I live in Switzerland, so having to go to London might sometimes be a bit tricky. I will only be able to afford one of the two style (Black Tie or Morning), and I have no clue which taylor to pick in London, let aside Switzerland. 1) Any advice on which style between Black tie and Mornning coat I will use more in my life ? 2) Any advice on a taylor in Switzerland ? 3) How to pick between let’s say Henry Pool and Gieves & Hawkes ? Any one of those you would specifically advise regarding the mentioned styles ? 4) How many fitting session should I plan (in other words, how many trips to London)? 1 – Black tie. You’ll use it far more. Though I generally dislike it for weddings – they are really day events most of the time. 2 – No, sorry, though a few like Cifonelli visit. 4 – At least three trips, ideally four…. Thanks for the prompt answer. I will have a more in depth look on your website regarding a morning coat then. About a black tie, any specific advice? Because to be honest, I’m so uneducated in the matter I have trouble to see style difference between some tailors. Hi Simon I attend black tie sometimes twice a year and sometimes once in 2 years or so. Would it still be alright to leave the tux unworn over a few years in storage? What would be your choice of braces for black tie, both in terms of material, colour (/pattern) and straps? What weight cloth is your RA dinner suit? Do you know which issue of The Rake the original article was in? 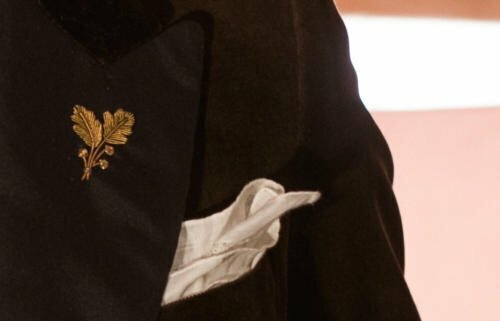 Does a formal dinner jacket have to have silk (grosgain or satin) facings? I have seen images particularly from the old Bond movies of Connery and Moore where they are wearing white/ivory dinner jackets without silk facings? 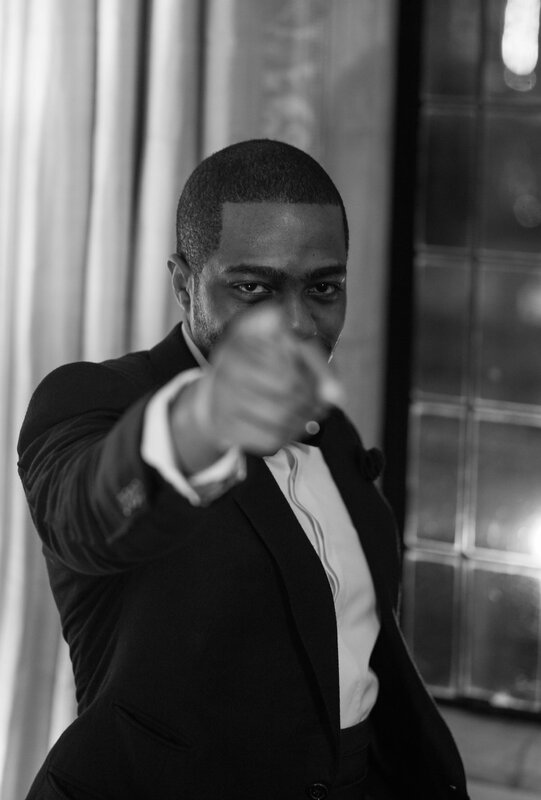 Another year – another black tie question if I may? I have been requested to buy a peak lapel black dinner suit. Happily this can be special order rather than RTW. Do you have any recommendations on pockets for both the jacket and trousers. The jacket template has straight jetted side pockets and a breast welt pocket. Would you support this? For the trousers, would you suggest no pockets, horizontal or straight side pockets? I suspect a hip pocket may be poor form as too casual/functional and breaking the clean lines but I may well be wrong! Many thanks as ever Simon. Love the photos and the variations of dinner suits. If you don’t mind my asking, where did you get the gold oak leaf ornament? It is most exquisite and subtle. In another post you mentioned opera pumps as one of the three preferred shoes options for black tie. Do you have any recommendations for shoemakers to consider? Also, I wear orthotics, so I am unsure if going bespoke would be a good approach for my other shoes. I am not certain I would want to go bespoke on shoes for black tie because I would wear them maybe two or three times a year. Yes, I think it might be hard to justify that price. Foster’s do some nice pumps as I recall, and I also like wearing Baudoin & Lange black-suede Sagans. Thank you for your quick response. I’m intrigued by the Sagans but unsure if I’ll look too out of place with black suede loafers at a black tie event. I have patent oxfords from Brooks Brothers already – I just don’t like them that much. Would getting a wholecut oxford bespoke also be a good compromise – better chance of fitting, plus more use of it outside of formal events? Or are the Sagans both something people would not blink at (because it is somewhat similar to an opera pump) plus versatile outside of formal events? I usually wear jeans and a dress shirt for work, and chinos or wool trousers on weekends, if that tilts the recommendation one way or another. Unfortunately I don’t think back sagans or Oxfords would be much use with that daily outfit. I think I will then go with either the pumps or the black-suede Sagans, and base it solely off black tie. I still have an eye on having a wholecut shoe, but will choose another color than black and may decide to deviate by adding a medallion. I don’t mind the risk of it looking a tad too formal. My thanks for the advice! It seems like all your dinner suits/smoking jackets are from British tailors. Do you have anything from an Italian tailor and if you don’t would consider it? If not, is there a particular reason why? in two months and i’d like some advice on what to wear. ideally, i’d like to go full black tie (midnight blue tux with a big shawl collar and just one button, bow tie, deep cut waistcoat and suspenders, patent leather shoes) but the issue is that all the rental places nearby don’t carry that style. i work at a suit shop, but the closest rental i can find to what i want is just a notch lapel, two button jacket and the vest is regular, not deep cut. i was wondering how strict your definitions are for black tie, and if i should just compromise and go for the rentals at my work or if i should search harder elsewhere to get what i want. I think it’s unlikely youre ever going to find exactly what you want, particularly the shape of the waistcoat, but’s probably worth searching a little harder, at least to avoid a notch lapel on the jacket. A quick question in regard to tailoring of a tuxedo. I have become used to getting my jackets made by the likes of Elia Caliendo, appreciating the softer Neapolitan tailoring of the shoulders etc. However, I feel a tuxedo should have a sharper look – slightly stronger shoulder etc. Would you agree? What elements of a three piece tuxedo would/should differ from a normal three piece suit, in your opinion? And who would you recommend for the making of a really nice tuxedo? Or do you think it’s simply a case of explaining the look required to somebody like Elia and him being able to adjust accordingly? In general I would have a tux cut sharper and more structured, yes. Although a Neapolitan tux can be a nice way to introduce something different but subtle to the outfit. I have seen various pictures of men ‘dressing up’ evening wear with a velvet jacket, often a coloured one, and I was wondering if these are worn with the ‘normal’ tuxedo trousers? It’s difficult to tell from the pictures online. Many thanks! I would very much appreciate some of your exceptionally knowledgable feedback on a three piece evening suit/tuxedo. The jacket is to be one-button, single breasted peaked lapel with grosgrain lapels. I am thinking of a double-breasted waistcoat to go with it – any style aspects that I should seek out and or avoid? 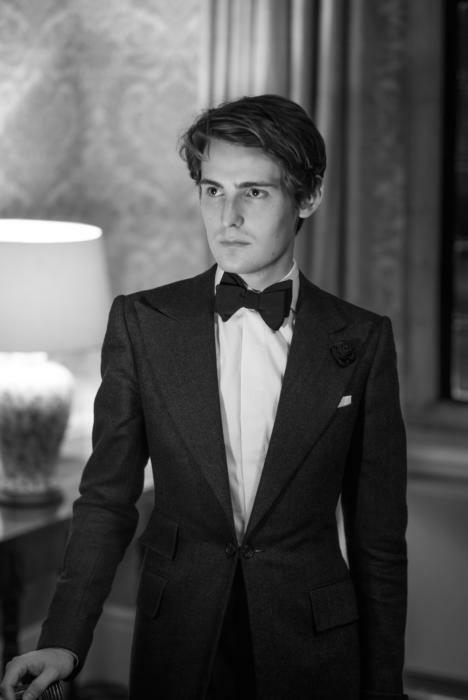 In particular: in terms of classic style and etiquette what style lapels would be best on the waistcoat with this type of suit (shawl collar – in grosgrain to match the lapels of the suit perhaps?) And how many buttons do you favour? Many thanks Simon. Many thanks Simon. If I went with a single-breasted waist coat, as you prefer, would that be four button too, horse shoe shape? Four or five, see which you prefer with the tailor. And no, I don’t like horseshoe-shape SB waistcoats generally. I have a wedding three days before Christmas. It’s not black tie, but I thought of wearing black velvet sport coat white shirt and traditional black watch plaid tartan. Then I found a terrific pair of purple tartan trousers. Are they sufficiently “Christmasy” enough? Or should I stick with the traditional green?